A table and chair with a spidery appearance were constructed to look as if they are viewed through a fish eye lens. One of the legs of the table has been replaced with a small glass lens. Hanging from the ceiling is 4-inch monitor stripped from its housing and overhanging the table like a lamp. In the English language version of the work, a man (the artist) is heard reading an excerpt from Maurice Blanchot’s Thomas the Obscure, and an image of his face is refracted through the lens in the table and projected onto an open book that sits on the chair. He appears to be looking through the text from the other side as he reads. (In the French language version, the voice and face of a woman reading the same excerpt replace the artist’s image and voice.) The book has been modified and bound in bright red, suggesting the underbelly of a black widow spider. 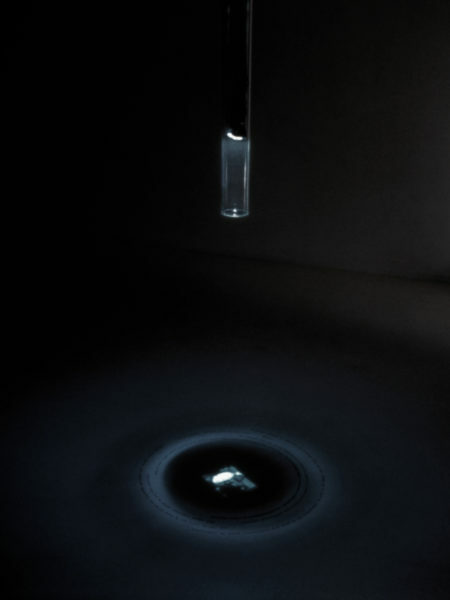 A second component (also referred to as the “arachnid chamber”) consists of a hanging glass tube approximately twenty-four inches long with a diameter of two and a half inches. Inside the tube is a modified 1 1/2-inch monitor dangling from black wires. The monitor displays an image of a typing electric typewriter ball. A text that reflexively speaks about the connection of the coming and going of thought and the movement of the typewriter ball—the way it reveals and obscures the words on the page—is applied to the floor. The light of the changing typewriter ball image illuminates different parts of the text on the floor as it changes. The sound of the typing is insect-like and heard from a 1 1/2-inch bare speaker hanging near the top of the tube. 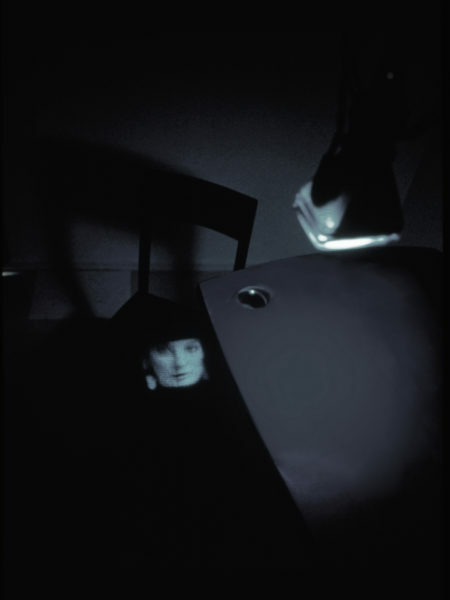 This was the first work in which Hill used surplus lenses and small monitors taken from video viewfinders to "project" images onto objects - in this case, a book, which led to the making of I Believe It Is An Image in Light of the Other, 1991-92. An example of this work was exhibited for the first time in a solo exhibition at Galerie des Archives, Paris, France, March 17 – April 14, 1990. “L’Amour de Berlin: Installations Video,” Centre Culturel de Cavaillon, Cavaillon, France, July 6 – August 26, 1990. “V.I.P. 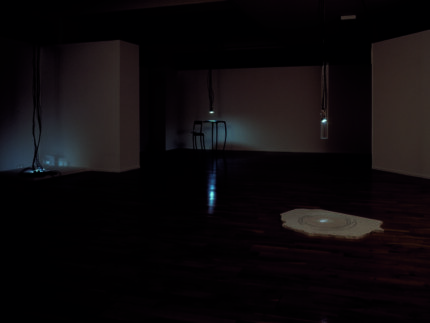 – videos – image(s) – peinture,” Galerie du Génie, Paris, France, October 20 – November 20, 1990. 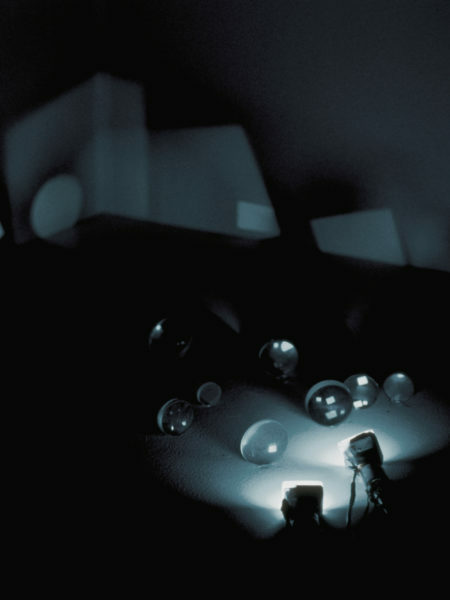 “Glass: Material in the Service of Meaning,” Tacoma Art Museum, Tacoma, Washington, November 2, 1991 – January 26, 1992. “C’est pas la fin du monde – une exposition des années 80,” Galerie Art et Essai de l’Université de Rennes 2; La Criée, Halle d’Art Contemporain; Galerie du T.N.B., Rennes, France, May 12 – June 27, 1992. “Métamorphoses,” Saint-Gervais, Genève, Switzerland, November 10 – December 12, 1992. “Gary Hill,” (travelling exhibition organized by the Henry Art Gallery, University of Washington, Seattle, Washington), Hirshhorn Museum and Sculpture Garden, Washington, D.C., February 17 – May 8, 1994; Henry Art Gallery, Seattle, Washington, June 10 – August 14, 1994; Museum of Contemporary Art, Los Angeles, California, December 19, 1994 – March 12, 1995; Guggenheim Museum SoHo, New York, New York, May 11 – August 20, 1995. 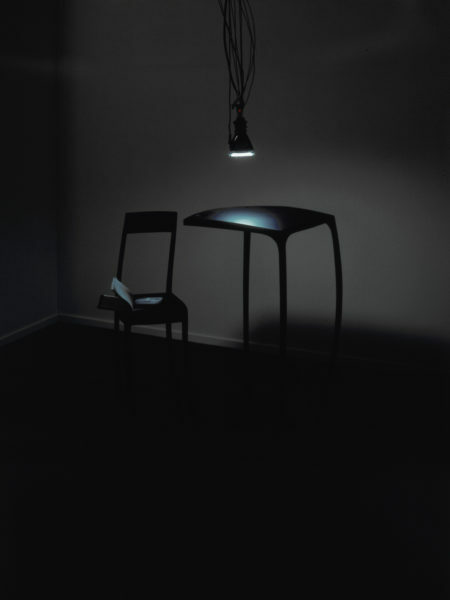 “Beeld/Beeld,” Museum van Hedendaagse Kunst, Ghent, Belgium, March 5 – April 17, 1994. “Immagini in Prospettive,” Cinema “Verdi,” Serre de Rapolano, Italy, April 17 – June 12, 1995. “feux terrestres,” Centre Régional d’Art Contemporain, Montbéliard, France, July 20 – October 15, 1995. “Sans commune mesure,” Le Fresnoy Studio national des arts contemporains, Tourcoing, France, September 21 – December 8, 2002. L'Amour de Berlin. Cavallion: Centre Culturel de Cavallion, 1990, unpaginated. V.I.P. – video –image(s) – peinture. Paris: galerie du génie, 1990, pp. 16, 17. Bourraiud, Nicholas. “Vagabondajes européens.” Globe 47 (May 1990), p. 130. Fargier, Jean-Paul. "Défense de Doubler." art press 147 (May 1990), p. 70. Sarrazin, Stephen. "Gary Hill at Galerie des Archives." art press 147, France (May 1990), p. 98. Lageira, Jacinto. "Gary Hill: The Imager of Disaster." Galeries Magazine (December 1990/January 1991), p. 74. Van Assche, Christine. "Gary Hill: The Imager of Disaster. Interview with Gary Hill" Galeries Magazine (December 1990/January 1991), pp. 140, 141. The 2nd International Biennale in Nagoya ARTEC '91. Nagoya, Japan: Nagoya City Art Museum, 1991, p. 32. Joachimides, Christos M. and Norman Rosenthal, eds. Metropolis: International Art Exhibition, Berlin, 1991. New York: Rizzoli, 1991, p. 154. Glowen, Ron and Kim Levin. Glass: Material in the Service of Meaning. Tacoma, Washington: Tacoma Art Museum, 1991, pp. 34, 35. Sarrazin, Stephen. “Objecten die leven Spreken, Tapes die Leren Zwijgen.” Andere Sinema 104 (July-August 1991), pp. 23, 24. “Europe: De Brest à Vladivostock.” Kanal (October 1991), p. 10. Romano, Gianni. “Inasmuch as it is always already taking place.” LAPIZ 80 (October 1991), pp. 36, 37, 41. Sarrazin, Stephen. Chimaera Monographe No. 10 (Gary Hill). Montbéliard, France: Centre International de Création Vidéo Montbéliard, Belfort, 1992, pp. 35, 38, 42 – 44, 58, 82, 84. (Including excerpts from an interview with Gary Hill). Van Assche, Christine. Gary Hill. Paris: Editions du Centre Georges Pompidou, 1992, pp. 6, 12, 43 – 45, 70, 81. (Including an excerpt from Gary Hill, “Inter-view”). Sarrazin, Stephen. "La parole aux objets." art press 165, France (January 1992), pp. 20 – 22. Mignot, Dorine. Gary Hill. Amsterdam: Stedelijk Museum; Vienna: Kunsthalle Wien, 1993, pp. 11, 16, 42. (Including an excerpt from Gary Hill, “Inter-view”). Van Assche, Christine and Corinne Diserens. Gary Hill. Valencia: Instituto Valenciano de Arte Moderno (IVAM), Centre del Carme, 1993, pp. 10, 16, 47 – 49, 74, 85, 130, 131. (Including an excerpt from Gary Hill, “Inter-view”). Sarrazin, Stephen. “Gary Hill. Dai un senso a ciò che muovi.” Flash Art XXVI, 174 (April 1993), p. 34. De Rijcke, Elke. “Dageraad of avondschemer over de video-installaties van Gary Hill.” Metropolis M 1 (1993), pp. 29, 30. Bruce, Chris. Gary Hill. Seattle, Washington: Henry Art Gallery, University of Washington, 1994, pp. 8 – 14, 97. Kandel, Susan. “Gary Hill: Museum of Contemporary Art, Los Angeles.” Artforum 33, 8 (April 1995), p. 87. Quasha, George and Charles Stein. Viewer. Gary Hill’s Projective Installations 3. Barrytown, New York: Station Hill Arts, 1997, pp. 9, 67, 68, 88. Dantas, Marcello. Gary Hill: O lugar do outro/where the other takes place. Rio de Janeiro: Magnetoscópio, 1997, pp. 50, 51. Morgan, Robert C., ed. Gary Hill. Baltimore: PAJ Books / The Johns Hopkins University Press, 2000, pp. 36, 78, 81, 85 – 86, 87, 154, 221 – 222, 296. Gary Hill: Instalaciones. Córdoba: Ediciones Museo Caraffa, 2000, p. 14. Quasha, George and Charles Stein. La performance elle-même in Gary Hill: Around & About: A Performative View. Paris: Éditions du Regard, 2001, pp. 14 – 15, 21 – 23, 69. Gary Hill: Selected Works and catalogue raisonné. Wolfsburg: Kunstmuseum Wolfsburg, 2002, GHCR 62, pp. 139 – 142, 236. Sans Commune Mesure: Image et texte dans l’art actuel. (Paris: Éditions Léo Scheer, 2002), pp. 150 – 151 (photos only). Odin, Paul-Emmanuel. L’absence de livre [Gary Hill et Maurice Blanchot – Écriture, vidéo]. Marseille: La Compagnie, 2007, pp. 192 – 193. Quasha, George and Charles Stein. An Art of Limina: Gary Hill’s Works and Writings. Barcelona: Ediciones Polígrafa, 2009, pp. 265, 274 – 275. …..Nevertheless, that day (as if a corpse borne from one bed to another were really changing place) she arose, walked before Thomas and drew him toward the little woods nearby, along a road on which those who came from the other direction saw him recede, or thought he was motionless. In fact, he was really walking and, with a body like the others, though three-quarters consumed, he penetrated a region where, if he himself disappeared, he immediately saw the others fall into another nothingness which placed them further from him than if they had continued to live. On this road, each man he met died. Each man, if Thomas turned away his eyes, died with him a death which was not announced by a single cry. He looked at them, and already he saw them lose all resemblance beneath his glance, with a tiny wound in the forehead through which their face escaped. They did not disappear, but they did not appear again. As far away as they became visible, they were shapeless and mute. Nearer, if he touched them, if he directed toward them not his glance, but the glance of this dazzling and invisible eye which he was, every moment, completely…and nearer yet, almost blending with them, taking them either for his shadow or for dead souls, breathing them, licking them, coating himself with their bodies, he received not the slightest sensation, not the slightest image, as empty of them as they were empty of him. Finally they passed by. They went away, definitively. They slipped down a vertiginous slope toward a country whence nothing was any longer visible, except perhaps, like a great trail of light, their last phosphorescent stare on the horizon. It was a terrible and mysterious blast. Behind him there were no more works, no silence, no backward and no forward. The space surrounding him was the opposite of space, infinite thought in which those who entered, their heads veiled, existed only for nothing. In this abyss Anne alone resisted. Dead, dissolved in the closest thing to the void, she yet found there the debris of beings with whom she maintained, in the midst of the holocaust, a sort of familial resemblance in her features. If he came straight up to her, brutally, to surprise her, she always presented him a face. She changed without ceasing to be Anne. She was Anne, having no longer the slightest resemblance to Anne. In her face and in all her features, while she was completely identical to another, she remained the same, Anne, Anne complete and undeniable. On his path, he saw her coming like a spider which was identical to the girl and, among the vanished corpses, the emptied….last descendant of a fabulous race. She walked with eight enormous legs as if on two delicate ones. Her black body, her ferocious look which made one think she was about to bite when she was about to flee, were not different from the clothed body of Anne, from the delicate air she had when one tried to see her close up. She came forward jerkily, now devouring space in a few bounds, now lying down on the path, brooding it, drawing it from herself like an invisible thread. Without even drawing in her limbs, she entered the space surrounding Thomas. She approached irresistibly. She stopped before him. Then, that day, seized by this incredible bravery and perseverance, recognizing in her something carefree which could not disappear in the midst of trials and which resounded like a memory of freedom, seeing her get up on her long legs, hold herself at the level of his face to communicate with him, secreting a whirlwind of nuances, of odors and thoughts, he turned and looked bitterly behind him, like a traveler who, having taken a wrong turn, moves away, then draws within himself and finally disappears in the thought of his journey. Yes, this woods, he recognized it. And this declining sun, he recognized that, and these trees drying out and these green leaves turning black. He tried to shake the enormous weight of his body, a missing body whose illusion he bore like a borrowed body. He needed to feel the factitious warmth which radiated from himself as from an alien sun, to hear the breath flowing from a false source, to listen to the beating of a false heart. And her, did he recognize her, this dead person on guard behind a hideous resemblance, ready to appear as she was, in the atmosphere studded with little mirrors where every one of her features survived? "It's you?" he asked. Immediately he saw a flame in a pair of eyes, a sad, cold flame on a face. He shuddered in this unknown body while Anne, feeling a sad spirit entering into her, a funereal youthfulness she was sworn to love, believed she was again becoming herself. This has always been it, a bewildering object in my path collecting more and more of whatever collecting tends to collect; when nothing clicks; when things just couple becoming twos instead of ones. And then it stops. Stops dead in its tracks. Backlogs. Rolls back on one of its many convoluted surfaces and sits there perfecting stillness. My gaze thickens before a black spherical object laden with dull silvery characters, symbols and numbers that, now and then, jolts forth and back, each time to rotate its discrete distance. The movement is quick, animated...like certain walking arachnids. Highly fragmented excerpts of text, which are seen more as textual webs of the work, from Maurice Blanchot‘s Écriture du désastre/The Writing of the Disaster.